Saturday I took Wookie for two half hour walks and to the dog park by myself since Joe was working. The idea was to tire her out so she wouldn’t be tempted to tear up any more carpet. Even so, we locked her in the kitchen just in case when we left for our friend’s party which was being hosted by his sister who lives in Joliet. I laughed at Joe when he assumed the party would be held outside but the joke was on me when I saw their garage was set up with tables and chairs. Thank goodness I dressed warm anyway because I’m always cold. Other people didn’t seem quite as prepared and I think people should have been warned. By the end of the evening my toes were frozen, but we still had a nice time. The kids spent their time in the basement so I didn’t have to worry about that after all. We were there about four hours and we stopped at a taco truck for a small snack with our friends before heading home. Joe went straight to bed since he had to be up early for work but I stayed up watching Netflix and hanging out with Wookie. Brother J has been harassing me about giving Big Mouth another shot so I watched a few episodes and now am hooked. I fell asleep on the couch. Sunday morning I picked up where I left off and basically watched the entire two seasons. I love Jason Mantzoukas – he has the funniest voice – and there’s so many other great actors voicing the characters. Joe worked all day Sunday so I took Wookie for a long walk and then to the dog park my myself again. We were there an hour and a half when she started shaking from the cold so we took off. I enjoy taking her there because it’s my only socialization during the day. I locked her in the kitchen last night but when I checked the cameras she was pacing back and forth and panting so I let her out into the living room and laid on the couch until she calmed down and went to sleep. I hate feeling anxious over whether she’s going to try and tear up more carpet by my desk. It’s not like her to be destructive anymore and I’ve been told she should see the vet to rule out any medical reason. She’s acting normal in every other way, though, so I’m going to wait and see if I catch her trying to do it again. If so, then I’ll make an appointment. In the meantime I might bring her crate back downstairs so when she’s in the kitchen she has a better spot to relax. I think she likes the bed by my desk because it’s tucked away underneath somewhat which makes her feel safe. It’s that time of year again where all your favorite shows (hopefully) return and new ones become available. It’s strange this year for us since we no longer have a DVR so we actually have to make a point to sit down to watch when the show actually airs and sit through commercials (oh the horror)! Although truth be told if we could just be a little patient we could watch all of our shows whenever we want since they show up on Hulu (or On Demand for the CBS shows) the day after they air. In any case, here’s what we’re watching now. Big Bang Theory, The (CBS, Mondays but moving to Thursdays) – We’re starting to lose our enthusiasm for this show. I think no matter how clever a show’s premise is after awhile it grows a little stale. Also, I can’t help picking apart certain facets such as questioning why a character like Sheldon would even have friends or what makes Leonard and Penny work as a couple when they have no common interests. At this point I wouldn’t be terribly heartbroken if the series was cancelled. Bobs Burgers (FOX, Sundays) – Still loving this show. I can’t decide who I enjoy more – Gene or Louise. I really loved the latest EP where H Jon Benjamin voiced the yellow toy. It sounded like the character Phillip on O’Grady (which was also voiced by him). Brooklyn 99 (FOX, Tuesdays) – Still very enjoyable and one of the shows I look forward to the most because Andy Samberg and Andre Braugher (who plays Captain Holt) are hilarious. I love their dynamic. Designated Survivor (ABC, Wednesdays) – I don’t actually care for this new show starring Kiefer Sutherland but Joe has decided to continue watching it so I’m listing it. Goldbergs, The (ABC, Wednesdays) – Still fun to watch due to the nostalgia invoked from growing up in the 80’s. Barry is my favorite character. Good Place, The (NBC, Thursdays) – Really love this quirky new show! Heard about it in a discussion thread and caught up on the first three episodes on HULU. Definitely part of the regular rotation. I would be bummed if I found out it was cancelled. Impastor (TV Land) – We saw this being advertised on a different channel and decided to see if it was on HULU which it is. We started watching the 1st season and are really liking this quirky show. I’m guessing we’ll be all caught up by the end of the weekend since the 1st season is only 10 episodes. I’m glad there’s a second season that just started airing. Kevin Can Wait (CBS, Mondays but moving to Thursdays) – I’ll be surprised if this lasts the full season; Kevin James seems to play the same character in every thing he’s in, but it’s cute enough to watch since it airs right after Big Bang. Last Man On Earth (FOX, Sundays) – Still liking this, but not so much that I’d be sad if it was cancelled. We hadn’t even noticed there was a new episode available until I happened to spot it on Hulu. Middle, The (FOX, Tuesdays starting October 11) – I’m sure we’ll enjoy this one like we did the past. Modern Family (ABC, Wednesdays) – Still amusing, although not as much as the earlier seasons. Scream Queens (FOX, Tuesdays) – I wouldn’t really miss this show if it went off the air but it’s entertaining enough to watch when nothing else is on. As you can see, we prefer the half hour sitcoms to most anything else. Not a big fan of drama or reality, although I do miss watching Dateline and 20/20 now that I don’t have any days to myself. I used to listen to them as I cleaned house back when we had a DVR. * Technically we won’t be watching the FX shows until the latest seasons show up on Hulu since that channel isn’t in our package. I only had one thing on my to do list on Friday, and that was to wrap Joe’s gifts. I’m happy to report that I got through it. I even wrapped E’s gifts even though I don’t love gift wrapping because I stink at it. I put my newest favorite show – It’s Always Sunny in Philadelphia – on Netflix and got to work. It was a nice relaxing day with a little productivity thrown in. Saturday we had lunch at Luong-Loi – our favorite Vietnamese restaurant. It was a long time coming. See, sometime over the summer we happened to drive past the restaurant’s location when I noticed the storefront was completely empty. No sign or anything. The place was just gone. I was in shock, and extremely sad. I’m not sure what possessed me to check out their website about a month or so later, but I was excited to learn that they were actually moving the restaurant across the street and would be reopening in October. Except they didn’t. We happened to drive past the old location again and there was a sign in the window that said “we went back to Vietnam”. I was so confused, but I thought that meant they changed their mind and wouldn’t be returning after all. Finally they started communicating via their Facebook page that they were back from vacation and working on the new restaurant. There were some delays thrown in so their reopening date kept getting pushed back until they finally opened this past Friday. We were so excited we ended up order four dishes – mongolian beef, garlic chicken, sweet & sour chicken, and kung pao chicken. With the exception of the beef, which tasted fishy, everything was as delicious as I remember. I particularly like the kung pao (which I’m eating right now as I type out this entry, in fact). I’m also happy that each dish comes with it’s own side of rice unlike before where they’d bring one plate of rice that wasn’t enough (and not bring out any more so I’d have to make more rice at home to go with the leftovers). I’m bummed that the mongolian beef isn’t good anymore, but happy the kung pao is since they introduced lunch specials for only $8. Much cheaper than just ordering a ton of food like we did. Saturday night we were invited to a game night at my friend, C’s, house. We go to lunch every so often and trade magazines (I get her People magazines which is awesome since that subscription is expensive) and she’s been to our house a couple of times, including once for a game night with her husband years ago. We brought Uno Attack with us which we played first. Then we played one of their games, Pay Day, which we’ve never played before. It’s fun! I won too. Hehe. Their cat finally came downstairs after we had been there a couple of hours and even let me pet her which they said is unusual so I felt special. She’s such a beautiful cat – grey with green eyes. And she doesn’t shed just from being touched, unlike the two orange kitties I was pet-sitting earlier this month. The time just flew by – we arrived at 6 pm and ended up leaving just after 10:30 pm. It was a fun night! I didn’t care for Modern Family when it first aired, and even when we would catch an episode here and there, I still wasn’t thrilled with it. But I guess repetition breeds likability, because Joe has been watching some of the reruns in syndication and now I’m really liking the show too. So much so, that Saturday we borrowed the 1st season from the library and have already watched 12 episodes. Funny how that works, huh? Something similar happened with The Big Bang Theory too. I don’t think we started liking it until maybe the 2nd or 3rd season. Of course, we have what, six seasons of Modern Family to watch to get caught up, right? Challenge accepted. 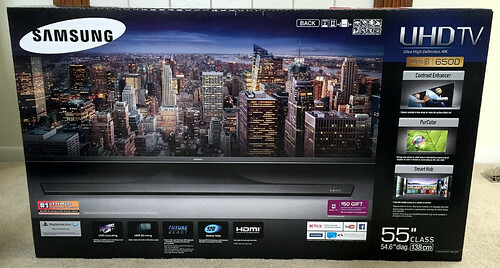 We finally decided to replace our ten and half year old 42″ Panasonic 480p plasma with a 55″ Samsung 4k Ultra High Definition TV we purchased from Costco for $1097 (before tax). We weren’t 100% sure we were ready to upgrade since the plasma’s picture is still quite good, but with Costco’s awesome return policy (90 days to try it and return it for a full refund), there was no risk in giving it a try. What’s amazing is that we paid nearly twice that for the plasma. Honestly, though, I’m pretty bummed that plasma lost the HDTV wars even though they are a superior technology. Too bad Panasonic did nothing to promote it and allowed the inferior LCDs to win. And while the new TV is impressive, it has its drawbacks, such as dark corners (which all LCDs/LEDs suffer from) as well as only being 60hz. But the only technology that is superior to plasma, OLED, is way too expensive right now, and will probably be out of our price range for several years. So our choice was to make due with the plasma for even longer, or make the new TV work. The first few days with the new TV were rough and we were considering returning it. The picture was actually too crisp and life-like. I don’t want to feel like the actors are in the room with me – that’s creepy! Plus everyone’s movements were strange. We read some articles and played with the settings and now things are much better because we got rid of what is known as the soap opera effect. I could not see trying to watch anything larger than 55″, though. The room is just not big enough. As it is, it took some getting used to the screen. I felt like when you’re at the movie theater and get stuck in the first few rows and everything is overwhelming your senses. I’m happy we were able to adjust to the new TV because it’s nice having four HDMI ports – all our devices can remain plugged in at once unlike before. Plus streaming from Amazon, Netflix and YouTube is so quick and easy. No more need for the Chromecast downstairs either. In fact, E and Joe moved the plasma into our master bedroom and we moved the LCD into E’s room and plugged the spare Chromecast in there. He loves being able to watch YouTube videos in there at night. And we love our new TV – in just nine days we watched all three seasons of Orphan Black. What a great show!